Jules Plisson kicked a late penalty to save France the blushes and help his team beat Italy 23-21 at the Stade de France in the opening Six Nations match. France outscored Italy by three tries to two but Italy led for much of the second half and looked like they could pull off an upset before France surged back into the lead. Italy could have snatched the win in extra time with a drop goal but Sergio Parisse’s attempt went wide. Plisson’s match-winning penalty came four minutes from full time and denied Italy what would have been a famous first Six Nations victory in France. Italy led for almost the entire second half at the Stade de France and New Zealand-born fly-half Kelly Haimona’s penalty six minutes from time looked to be sending them to a first away win in France in the competition. Talk before the match — the first at the Stade de France since the Paris terror attacks last November in which the stadium was targeted by suicide bombers — had been of a new era under Guy Noves for France, who certainly played like a side determined to put behind them the dismal Philippe Saint-Andre era. Sebastien Bezy missed the conversion to add to an earlier missed penalty in what would become a feature of the first half — all five place kicks attempted by the two sides were missed. 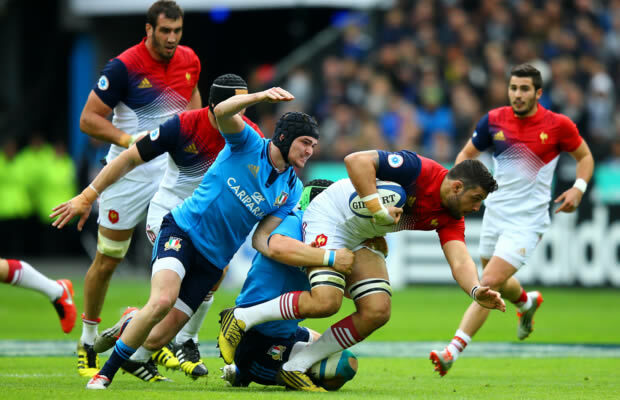 Italy knocked on and turned over the ball in France’s 22 but rather than take the scrum, the hosts launched a daring raid. They were rewarded for such innovation on 33 minutes as a quickly-taken penalty from right in front of the posts by Gael Fickou resulted in Chouly scoring France’s second try. Italy could have gone into the break in front instead of trailing 10-8 but with the last action of the half, Michele Campagnaro’s arm turned out to be an inch too short as he stretched to ground the ball after a brilliant break took him up to the tryline. Four minutes into the second half, and at the sixth time of asking, a place kick was finally landed as Canna’s penalty gave Italy the lead 11-10. In a topsy-turvy finish, Haimona’s penalty on 74 minutes gave the visitors a lead that lasted less than two minutes before Plisson kicked his second penalty. Italy could still have won it but Parisse’s woeful drop-goal attempt beyond the final whistle sailed well wide and France had held on.